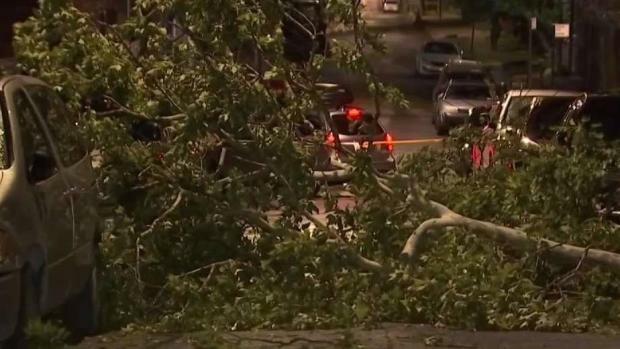 A huge tree crushed a woman’s car in Queens, a man needed rescue after a large limb fell on him and power was knocked out for some as powerful storms ripped through parts of the Big Apple Thursday night. The pop-up storms sparked rare tornado warnings for Queens and the Bronx, as well as Nassau County on Long Island. National Weather Service crews determined a tornado did touch down in Queens. In College Point, a woman’s car was damaged when a massive tree crashed down on top of it, video shows. Another video shows a man getting help from paramedics after a large tree limb fell on him. Con Edison reported early Friday that the neighborhood had around 60 customers in the dark. Trees were toppled, a man was hit by a falling limb and even customers were in the dark. Katherine Creag reports. A severe thunderstorm even forced a stampede of concertgoers to seek shelter at the Beyonce and Jay-Z show at MetLife Stadium in New Jersey. The concert started at 11:08 p.m. and Beyonce thanked the crowd for staying around. The show resumed after nearly an hour with Beyonce thanking the audience for remaining. “Thank y'all for riding. It's like 1 something in the morning," she said. "God bless you. We appreciate you. We love you." Beyonce and Jay-Z will perform again on Friday, when even more severe storms are expected, especially north and west of the New York City.